If you have a dog, you know already that they love to chew on things. Sometimes the chewing is productive and confined, like to a specific bone or chew toy. Other times, your favorite pair of shoes might quickly become the shoes that used to be your favorite. Where exactly does this gnawing habit come from? 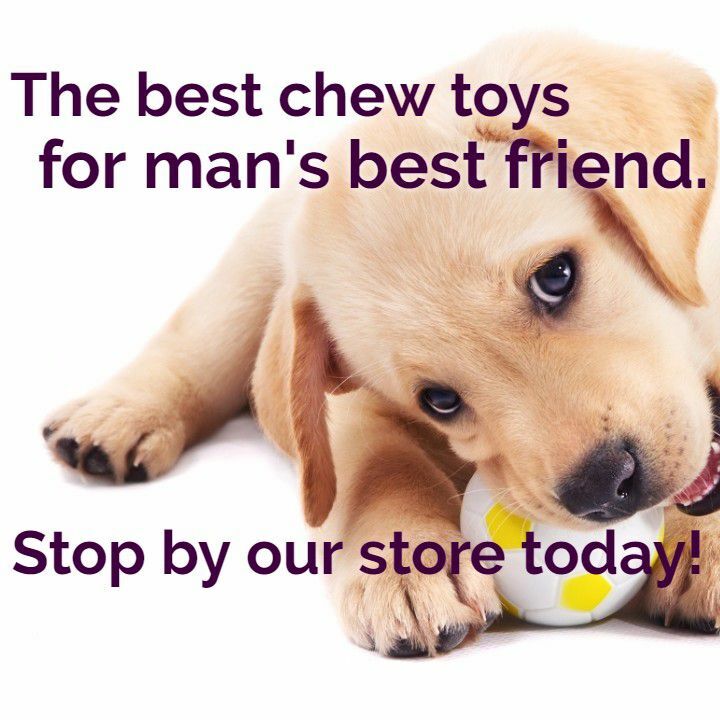 Royal Pets Market and Resort has an incredible array of chew toys for any dog to enjoy, because we know how important healthy chewing habits are for your pooch. Read on to discover some facts about why dogs chew, and then be sure to stop by our store to pick up a new chew toy or two! Why Do Dogs Chew on Objects? Dogs at any age can often be found gnawing on something, and that is totally normal. As the ASPCA reports, “For young dogs, [chewing] is a way to relieve pain that might be caused by incoming teeth. For older dogs, it’s nature’s way of keeping jaws strong and teeth clean.” Dogs also chew to relieve boredom, or work off mild anxiety. Why Do Dogs Chew On Things They Shouldn’t? If a dog starts to chew on anything or everything in their path, this is commonly referred to as destructive chewing. The usual cause for this destructive chewing comes from separation anxiety, which dog owners are more than familiar with. Everything’s fine when the humans are home, and all the destruction happens when they’re away. Additionally, destructive chewing is pretty typical in puppies, who are exploring their environment and soothing the teething process they’re undergoing. Just as they are looking for stimulation, older dogs who are destructive chewers might not be getting enough mental and physical stimulation. Another source of destructive chewing is from hunger. If a dog is chewing on things that smell like food or are related to food, this might be a sign that they’re wanting some extra food. However, don’t take this as a sign of necessarily having to give your dog food! Some dogs need to be on more calorie-restricted diets, like if they are overweight or are undergoing medical tests. How Can I Stop the Destructive Chewing? There are lots of reasons why a dog might be destructive chewing, but fortunately, there are just as many methods to try curbing their negative chewing habits! A general rule is to make sure your pup has enough chew toys or edible chews that will keep them satisfied. Dogs are like humans in that each one is unique; a chew toy that one dog finds intriguing might be the opposite for another dog. Check out our pet store to get stocked up for your dog’s chew toy supply! Put valuables and objects that might trigger dogs away. If a dog wants to chew on something and there’s no one there to stop them, have patience. Remember that they are animals, and proofing your home to take away their negative temptations will help. Does your dog find your purse especially tasty? Move it out of their sight and reach, and you won’t have to worry. Make sure your dog gets proper stimulation. A lot of destructive chewing comes from a lack of stimulation, so ensuring your dog is getting good amounts of exercise and attention is crucial. If you have to keep your dog in a crate, try to let them out at least once every six hours so that they don’t go crazy. In more severe cases, look into some chewing deterrent to put on some objects that are common chew toys around the house. This deterrent might be a good idea for the legs of furniture, or other objects that cannot easily be moved out of reach. Talk with someone at Royal Pets Market to see what their recommendation is on implementing deterrent in your household! Try different chew toys until you find one that works for your dog. Maybe they’re keen on tennis balls, or maybe they need a rubber toy with some peanut butter. When you find a toy that your dog enjoys, things will go more smoothly for both of you! Summer is wonderful for getting to spend more time with your dogs. With longer days and warmer weather, it’s fantastic getting to take them for longer walks, or just throw the tennis ball around for a little longer than usual. Since there will still be times when you’re not going to be with your dog, it’s important to prepare them to be set up for chewing success. But don’t bite off more than you can chew, stop into Royal Pets Market and Resort to get the best chew toys for your dog! Check out our St. Petersburg, Palm Harbor, or Carrollwood locations today!